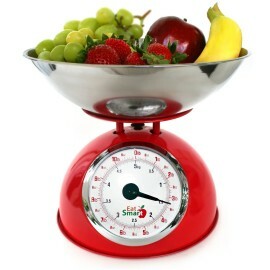 Home » Nutrition » Not Losing Weight? — Try Measuring Your Food! Not Losing Weight? — Try Measuring Your Food! Have you been dieting but still not losing weight like you’d expected? Have you been working on your abs in the gym and fixing your diet, but still don’t have the definition you want? There’s validity to the adage passed around the gym that “abs are made in the kitchen.” And when it comes to the food you eat, equally as important as the quality of the foods is the quantity. It’s simple; unless your body is burning more calories than it’s taking in (AKA a caloric deficit), it will be physically impossible to lose weight and burn fat. Clearly the quality of the food is important as well, but the point is that if you ate healthy foods — yet failed to eat in a caloric deficit — it would be impossible to lose weight. With that in mind, what can you do to ensure that your food intake meets your goals? Keep a food diary! The recommendation to keep a food diary has been prevalent in the diet and fitness world for decades, and this old trick has surely withheld the test of time. The key to a successful food diary is cut and dry: accuracy. For a simple calculation, lets assume you underestimate the amount of food you eat by only 20%. Therefore if you intend to eat 2,000 calories per day, you will likely eat closer to 2,400 calories per day, which would equate to an additional 2,800 calories — or about 0.8 pounds of fat (3,500 calories in one pound of fat) — by the end of the week. Since we’re not good at estimating the amount of food we consume, that means you need to use tools to measure and track the food you eat! While tracking your food intake may seem tedious, if you make it part of you’re routine it really isn’t that time consuming in the process of food prep. Fortunately keeping track of food intake is much easier than it used to be, as there are various websites and smartphone apps that have a large database of foods. My favorite is MyFitnessPal, which has some really convenient features such as the ability to scan a barcode from your smartphone or save combinations of food you frequently eat as “meals” for easy entry into your food diary. Obviously you won’t be able to carry a measuring cup and food scale with you when eating out, although after a few weeks of measuring all of your food at home it will be much easier to accurately estimate portions when eating out. Give this a shot and finally reach your goals! Stay disciplined and watch the pounds come off and those abs come through. The body transformation alone should be motivation enough for you to stick with it. 1. ↵ Lichtman, SW, et al. “Discrepancy between Self-Reported and Actual Caloric Intake and Exercise in Obese Subjects.” New England Journal of Medicine 327.27 (1992): 1893-898.